We have a new puppy. The other day, I took her to a nearby park for a romp. All around us was color. Glowing leaves floated, drifted, and twirled down to earth, and reminded me that fall is a verb. As is spring. Winter and summer can be verbs, too — maybe fall and spring are what plants do, and winter and summer are what animals do. 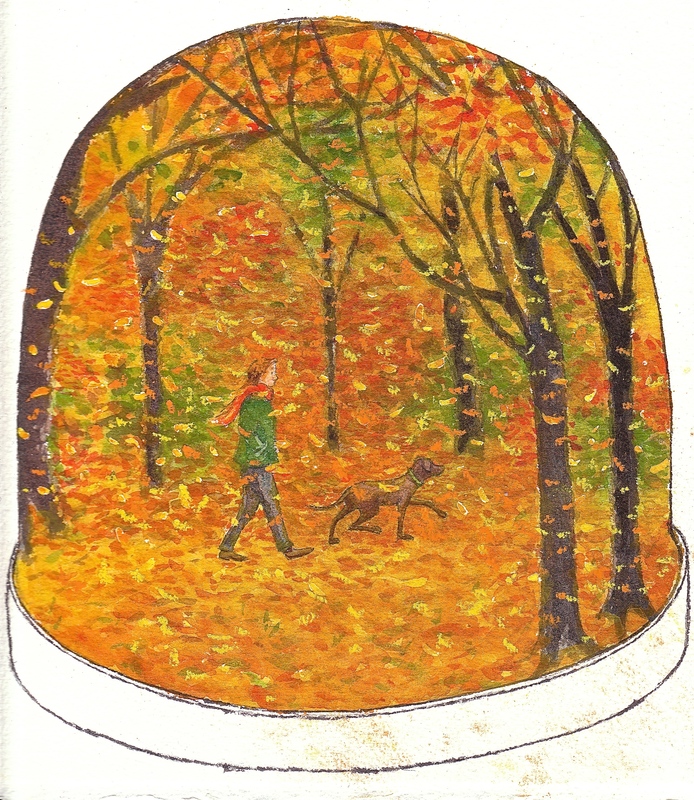 I also wondered why snow globes are a thing, but as far as I know, no one makes leaf globes. Why not? 1. 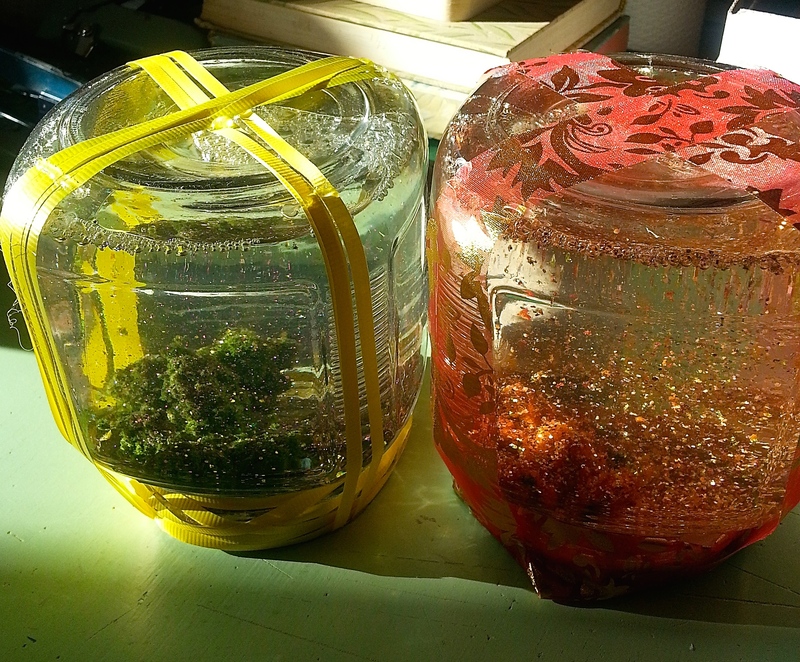 Wash and dry a jar and its lid thoroughly. 2. Make sure figures are not water-soluble and will fit inside, then glue them to the lid with waterproof glue or cement. Let dry. 3. Fill jar nearly to top with distilled water. 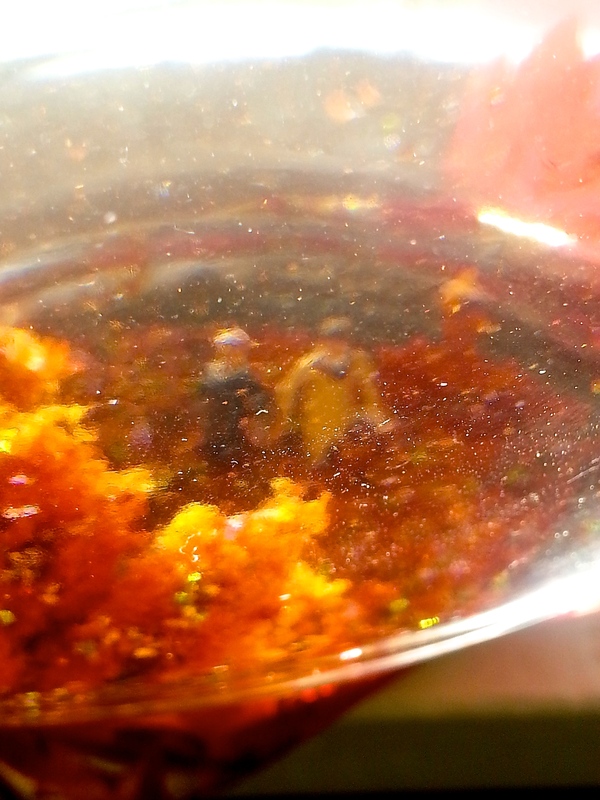 Add a few drops of glycerin (from the drugstore) and a few pinches of yellow and orange glitter. 4. Smear a little adhesive inside the lid and screw it on tightly. 5. Let the lid-glue dry, then flip it! One note about the picture above: the fictional element is the size of the pup. Our new pup, Hazel, is not that big yet. It’s just how the drawing came out. We have been having some festive events lately, to celebrate the publication of Nuts to You, my squirrel-centric adventure story. 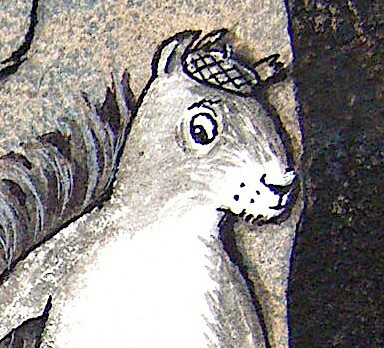 I offer here some squirrelific activities, ranging from the ridiculous to the sublime. I leave it to you to decide which is which. How to make them? You need cookie dough, and squirrel and acorn cookie cutters. 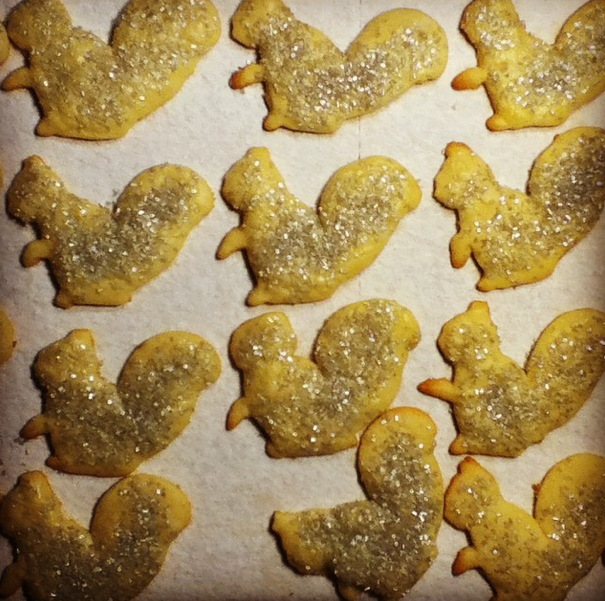 I will put my recipe at the end of the post, but you will need to find your own cookie cutters. #2. 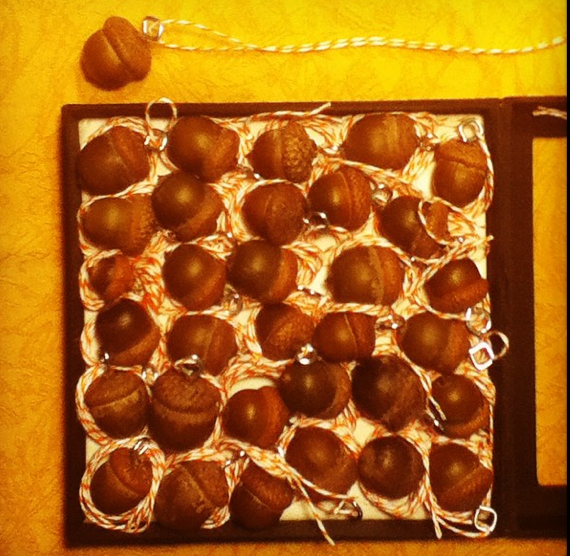 Acorn necklaces. Easy-peasy, as Jed might say. 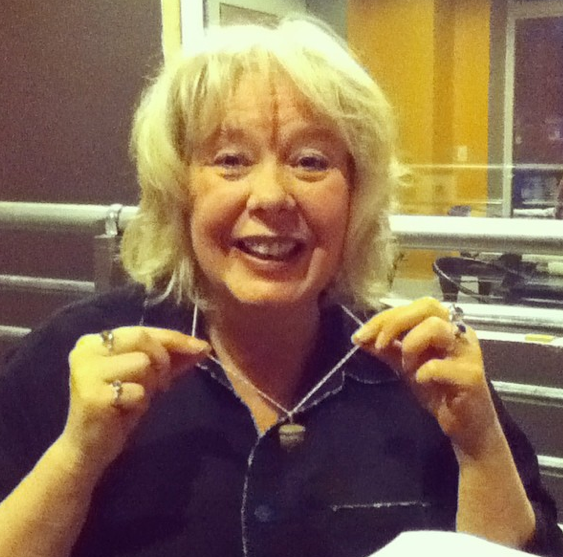 Put a screw eye into an acorn, and run a string through it (preferably a striped one), tie the string in a knot. Voila! #4. 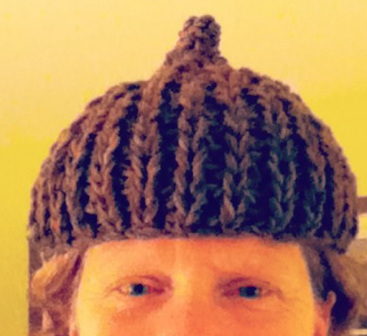 The acorn hat. I knitted one of these and raffled it off. You can knit one, too! It’s pretty easy. Instructions are below, after the cookie recipe. #5. Okay, let’s get serious. A little bit serious, anyway. 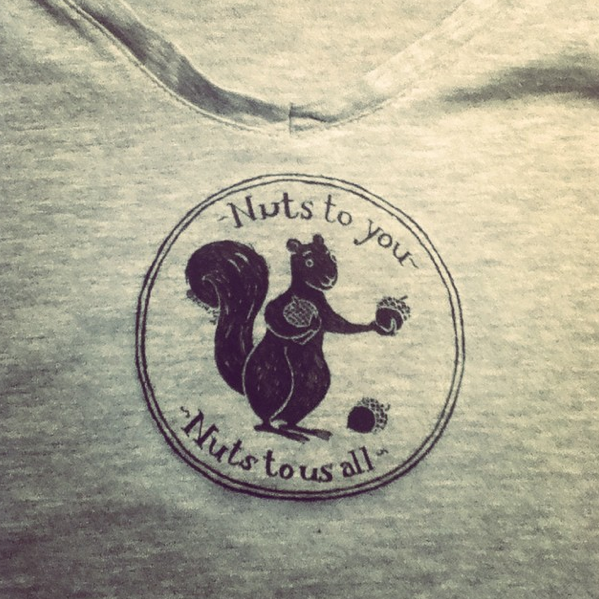 The best thing to do with Nuts to You is to read it aloud. We had a party at a local bookstore, and we read the whole thing aloud, in one sitting. We had 25 readers who each read a chapter, or thereabouts. We had actors, librarians, a local radio personality, a 14-year-old to represent the youth, and lots of people who just like to read aloud. I know it’s a little hard to see what’s going on here. The guy with the green tee shirt just right of center is the current reader. My bent over back (signing a book) is just beyond the woman with white hair in the foreground. This photo was taken by Doug Stanton (yes, the Doug Stanton) towards the end of the evening when we had lost some of our audience. Actually, it can’t have been that late, there are still cookies. Anyway, we had some FABULOUS readers. Let me tell you, for an author, there is nothing like hearing a really great reader read your story. And we had some pretty good refreshments, made by moi. Even so, here is my pro tip: Don’t read it aloud all in one sitting. I imagine a situation could arise where that suggests itself and feels just right. But it was a bit long. I think it’s better to break it up. A chapter or two a day, maybe. Still, it was an interesting thing to try. #6. Plant some trees, for crying out loud! Squirrels need them, and so do we. It doesn’t have to be hard. 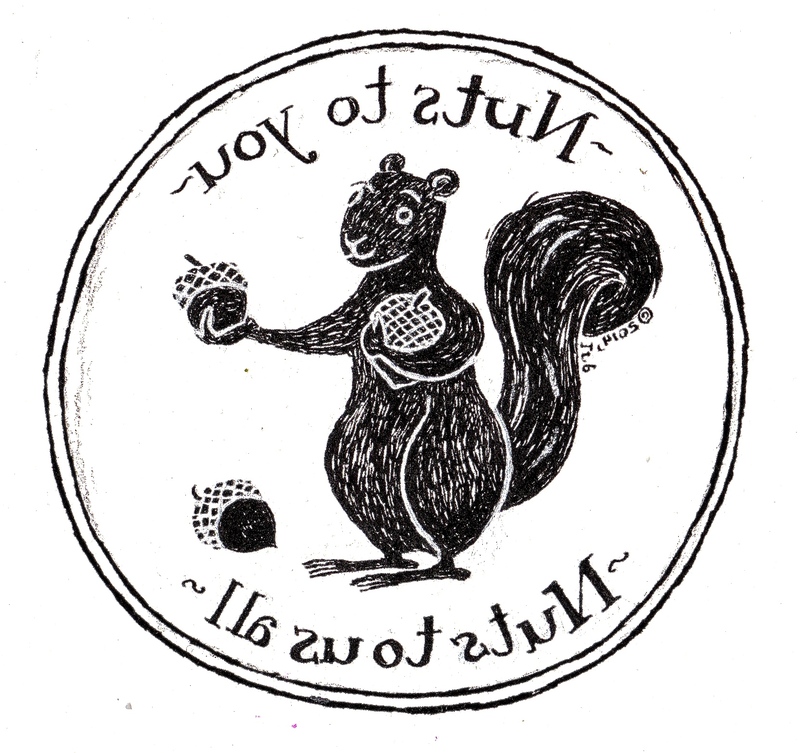 All you really have to do is push an acorn into the ground. If it’s winter and you can’t plant anything, talk to your local nature/land conservancy and find out about places where it would be good to plant trees, and what kind to plant. They may even have tree-planting work bees that you can participate in. #7. This is your turn. What is your idea? If you email me a good one at lynneraeperkins@gmail.com, I will pop it in. Sift 3 cups all-purpose flour, 1/2 tsp baking soda, 1 tsp cream of tartar, and 1 tsp kosher salt into a medium bowl. In a larger bowl, soften 2 sticks of butter. When soft, beat on high speed for 2 minutes until pale yellow and fluffy. Add 7/8 cup of sugar and beat on medium-high until very pale and very light. Scrape down sides and add 1 egg, 1 egg yolk, and 1 tsp vanilla extract. Beat for 30 seconds. Add the flour mixture and beat at medium low for about 20-25 seconds, making sure to scrape down the bowl. Refrigerate dough, covered with plastic wrap, for 1-1/2 hours. Roll out on a lightly floured surface until 1/8-1/4″ thick. Cut into shapes. Bake at 375 degrees for 6-7 minutes. p.s. The silvery sugar crystals can be found at Michael’s Crafts, and probably other places, too. How to knit the hat? Begin with size 13 needles, and knit with 2 strands of worsted weight yarn. I used slightly different yarns to make it more interesting. Starting at the bottom, cast on 55 sts. 1st row: K1, *p 1, k 1. Repeat from * across. 2nd row(right side): P 1, *k 1 below, p 1. Repeat last 2 rows alternately for 4 inches, ending with a wrong side row. Top shaping: 1st row: P 1, *k 1 below, p 2 tog, p 1. Repeat from * across, ending with k 1 below, p 1 — 42 sts. 2nd and all even rows: Knit. 3rd row: P 1, *k 1 below, p 2 tog. Repeat from * across, ending with k 1 below, p 1 — 29 sts. 5th row: *P 2 tog, p 1, k 1 below. Repeat from * across, ending w/ P 1 — 22 sts. 7th row: *P 2, k 1 below. Repeat from * across, ending with p 1. 9th row: *P 2 tog, k 1 below. Repeat from * across, ending with P 1 — 15 sts. 11th row: P 1, P 2 tog, * k 1 below, p 1, p 2 tog. Repeat from * across — 11 sts. 13th row: P 2 tog, *k 1 below, p 2 tog. Repeat from * across — 7 sts. 14th row: Repeat 2nd row. Break off leaving a 10-inch length of yarn. Thread into a needle and draw through remaining sts. Pull up tightly and sew side edges together. I have knitted this hat 3 times, and I will admit that in every case, toward the end, I didn’t have the right number of stitches. but it seemed to work out anyway.